Whether it glows like an angel or shines like a jewel really depends on your appetite. The Thistle’s Rendez Vous Restaurant continues to wow diners on Newcastle’s busy Neville Street. Train Station opposite. On the one hand the Thistle Newcastle is traditional and tastefully decorated Grade II Victorian Listed building and on the other it is a terrifically well-equipped modern hotel in the heart of a handsome and diverse city. Visitors to the hotel and the Newcastle area will be confronted with the joy of two extremes: the magnificent architecture and beauty of their immediate city location and the rolling countryside, wild moorland and award-winning golden sandy beaches that lap around its industrial edges. The Angel of the North doesn’t hold sway over this city for nothing – it is a testament to its increasing status as a true jewel of England’s North East coast. 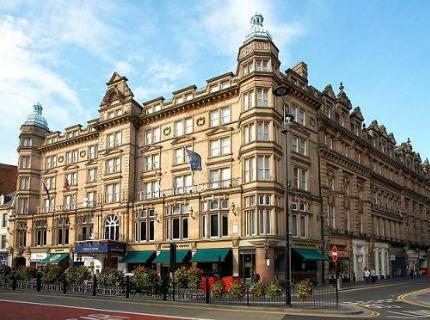 Located directly opposite Newcastle's central railway station, the Thistle hotel plays host to over a hundred well presented en-suite guest rooms including 10 executive suites. Amenities include BT Openzone wireless broadband now available throughout the hotel, flat screen LCD TV with Freeview, work desk, direct telephone, complimentary toiletries and bathrobes. The newly refurbished Rendezvous Restaurant and Bar, opening early March, offers international cuisine in a comfortable, relaxed and informal atmosphere. An extensive 24-hour room service menu is also available.